Panoramic mountain views, shuttle to the finest skiing, great snowmobiling tours available, making snow angels by your own hot tub, close to boating and fishing ... summer, winter, spring and fall, Moose Hollow, Unit C-105 has it all. Heated floors, private hot tub, pool table room, Huge private theater room, three fireplaces, two master suites (One complete with wet bar, one master on the main) three levels for plenty of room. 2 car garage, access to the association pool and hot tub and game room / fitness center. Everything is included, plenty of dishes, glasses, cooking utensils, pots, pans, crock pot, coffee maker, Keurig, paper towels, dish soap, dish washer soap, laundry soap, all the towels and linens, etc... we even have a gas BBQ downstairs by your private hot tub. Thanks for looking at Cascades 105! I have lived in Eden the past 17 years, and often say that Ogden Valley is truly "Utah's hidden gem"! Living in such a wonderful place has given me the opportunity to make many friends from all around the world. Me and my family enjoy year-round activities in the area that include hiking with my dogs, boating, skiing, and kayaking. This is the perfect location where you can unplug from the fast pace of life and reconnect with the unlimited outdoor activities that exist just outside your door. These activities including, skiing, hiking, mountain biking, boating, golfing, just to name a few. There is always something going on in the area including outdoor concerts and balloon festivals. Many resort towns are over-built and over populated, Ogden Valley allows you to get back to your childhood memories. Located just one hour from the Salt Lake International airport and minutes from 3 ski resorts, Snowbasin Resort, Powder Mountain and Nordic Mountain. You can look off the balcony and look directly at Powder Mtn or Wolf Mountain. Snowbasin is visible out the front door. Keurig and standard coffee maker both available, please bring your own K-cups. Theater Room w/ lots of seating. Apple TV so bring your Netflix passcode and any other you would use to stream movies. 500 sqft Theater with massive big screen Apple TV - Also, because I wanted this home to really appeal to families, I put puzzles, board games, chess, lots of great books etc etc. We had six adults and really enjoyed our stay here. Not a lot of options for dinning out or night life which was fine, we did have a great time at Carlos and Charlies and we tried the pizza at the Alpine Pizza (next time we will try there pasta). The grill and kitchen were all used quite a bit as was the nice entertainment room downstairs (bring your own movies). Like others have said regulating the temperature on all three floors is next to impossible, I was on the third floor and it was hot, had to sleep with the window open and the shower heads in most of the bathrooms lacked pressure. That said these are fairly trivial thing all things considered. The price is right and this is a very nice unit. If I make it back this way I don't know why I wouldn't stay here again. We have stayed at this property before, and we were not disappointed this time. 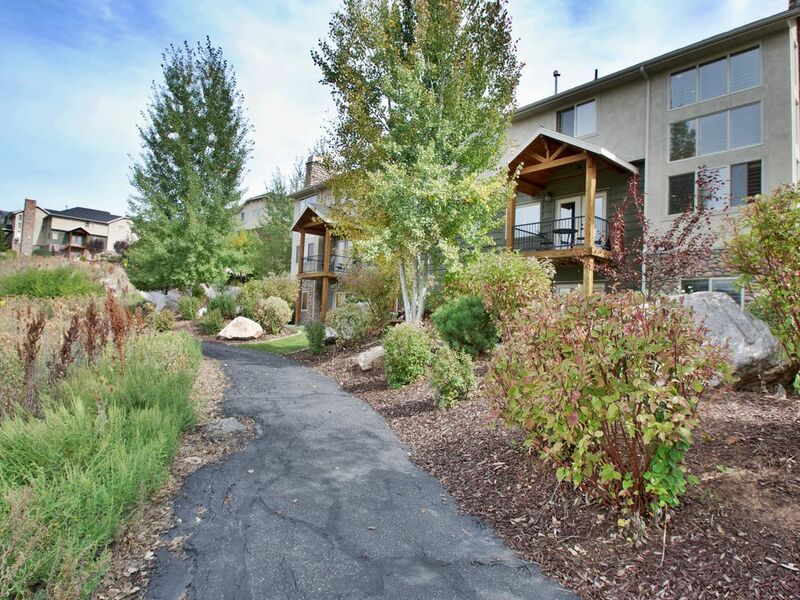 It is a perfect fit for our large family, and we love the close proximity to Pineview Reservoir. Everything was as promised, and we will certainly be back. The AC never worked on one side of the condo both main level and upstairs: we called all the contact numbers and no response and finally flagged down a maintenance worker by the pool. He came to "fix" it but it never worked. We roasted. It was pretty miserable. There were lightbulbs out and a broken lamp in one of the rooms and things like ice cream scoopers would be nice in the kitchen. On a positive note, the beds were soft and the rooms a lovely size. Plenty of room for party of 12. Great location 10-15 minutes from powder mountain. Fully stocked kitchen. Nice hot tub. Only con is that sleep sofas could be better. This was a perfect fit for our family reunion. There was ample space for our family. The two master bedrooms were amazing! The family room in the basement had a ton space. We loved the pool and it was never crowded when we were there. The only complaint we had (and it was fairly minor) was that the carpet was a little grimy and could use an upgrade. We really enjoyed our stay! Thank you so much for visiting us at Wolf Creek Resort and so glad you had a wonderful time - just scheduled a top to bottom carpet clean for next week as per your recommendation, thank you!! We were a group of 9 adults who stayed at the house for a ski vacation. The house was beautiful, comfortable, spacious and lacked nothing! For the few questions or concerns i had upon arriving, they were answered quickly and efficiently. The hot tub and pool table got put to use! The living room and kitchen area were large enough for our crowd to hang out. I would highly recommend this beautiful property for a vacation - winter or summer!